Winter is the time of year when most people like to park inside their garage. Keeping your car inside is very convenient weather you are dealing with rain, snow or just colder temperatures. With the weather getting colder people may or may not think about their garage door. The garage door is the largest mechanical object in most people’s home. When a garage door is not maintained by the homeowner or by a professional it could fail at an inopportune time. In the fall and winter months the wet weather can affect your garage door. If you have a wood door the increase in rain and humidity can make the door swell. If the door and the frame of the house are exposed to the elements they will both absorb moisture. When the door and framing swell the clearance that is left between the two decreases this can cause the door to start rubbing or jamb up when it is being used. It is very important to keep your rain gutters clean to avoid run over of water witch can splash onto the door when it hits the area in front of the door. 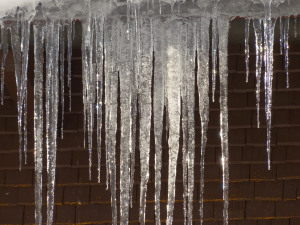 Another reason to keep water away from the garage door is in case of freezing weather. When the temperature drops if there is any water built up at the bottom of the door it can actually freeze shut. A lot of times when this happens unknowingly the person will go out to open the garage door and when they push the button the opener will not open the door. The only way to get the door to work if this happens is to melt the ice. Some overhead door professionals will argue other effects of cold weather. Here at Hung Right Doors we also notice an increase of service calls for broken springs when the temperature drops. Garage door openers can also react to the weather change. Some of the moving parts are lubricated with different products. These lubricants can change consistency with the weather. The adjustment that makes the opener stop and reverse if it hits something is known as the sensitivity. If the sensitivity is set to light the cold grease can thicken and cause the motor to think the door is hitting something. There are different types of garage door openers belt, chain and screw drive are a few of the most popular types. All of the different types have their own maintenance schedule. Refer to your owner’s manual before preforming any maintenance to ensure you are using the right products. Maintenance should be preformed on the typical garage door twice a year. Refer to your owner’s manual for the door and the opener prior to lubricating or making any adjustments. Consider scheduling a professional to come out for a service call once a year at that time the technician can perform the more complicated and dangerous adjustments like torsion springs etc. The technician should be able to show you the basic maintenance tasks that you can do yourself until your next service call. If you have any question give the Hung Right Doors team a call at 360.753.2222 for all your garage door needs in Lacey Washington, Tumwater, Olympia, Aberdeen or anywhere inbetween.